RUSH: Now, let me deal with this right off the top here, the reason that the House is having to revote on the tax bill. Folks, it’s like a broken record, but the media, they’re just lying, they’re just flat-out lying about pretty much everything about the tax bill. And if the polling numbers are right, that only 26% of the American people support it, that’s why, but I’m not sure I believe the polling data. The Drive-Bys are so hell-bent on attacking Republicans that they have claimed the Republicans screwed up with some of the provisions in the tax bill, which is why the House has to vote again today. But that’s not quite what happened. This is all about budget reconciliation and Democrats in the Senate. Some Democrat nitpickers complained about a couple of pro-education provisions in the bill that they didn’t like. A couple of pro-education provisions in the bill that they didn’t like. They said that these provisions violated budget reconciliation rules. And they whined to the Senate parliamentarian, who made the Republicans remove them from the bill. There was no mistake on the actual aspect of taxes or anything to do with taxes. There were no screw ups. There were no mess-ups. There was nothing whatsoever fundamentally wrong with this requiring the House to vote again. It was simply a bunch of Senate nitpickers arguing over parliamentarian procedure. Now, one of the provisions was to allow 529 savings accounts for homeschooling expenses. Does that sound like a bad deal? The 529 savings accounts, in other words, educational savings accounts, 529 savings accounts for homeschooling expenses. Another protected, endowments to private universities from being subject to a new excise tax. So is the media outraged at the Democrats stripping out some pro-education provisions? Of course they’re not. Instead, they’re amused as the Democrats make the Republicans have to vote again and they seize this as an opportunity to report the Republicans don’t know what they’re doing. Or, the Republicans are providing another hidden loophole to the rich or other such lie. Nobody said anything about the many ways that Obamacare violated budget reconciliation, which is called The Byrd Rule, by the way, for Sheets Byrd. Robert Byrd himself said it violated The Byrd Rule, but all that was ignored while they rammed Obamacare through. And the Republicans didn’t have the votes to stop it so they didn’t make a big deal about it. But, anyway, the revote has nothing to do with anything, other than parliamentarian procedures the Democrats wanted to nitpick. The House vote is gonna be identical to what it was. It is essentially a formality. It’s gonna happen around 1 o’clock this afternoon. And it will happen as it did yesterday, and then by the end of the week it will be signed. There’s gonna be a little victory bash at the White House today. Trump and some various Republicans, House and Senate members, coming up there to do a pre-victory victory party. Get this thing off and running. I’m looking at this, and we’ll get into the nuts and bolts of this here in just a second. But you know, everybody, the media, everybody is looking at 2018, and as you know, we’ve discussed, the Democrats think that they’ve got the House won already because of the election in Alabama, the election in Virginia, the Democrats think that they have won the House. It’s just a matter of the calendar playing out. They also think that this tax cut bill is gonna be a huge disaster. And it is. But for them. It’s gonna be every bit the disaster for them that the Reagan tax cuts were in 1981 and ’84. It’s gonna be a repeat. But they think, because of their brethren in the media, that they have been able to soil, if you will, or muddy the waters on this. And they think they have the American people positioned and ready to object to it, to hate it, to think it’s gonna be a bomb-out, a failure, the only people benefiting will be the rich. When in fact 80% of taxpayers in this bill are going to see bigger paychecks, one way or the other. Eighty percent of taxpayers are going to get a tax cut. Well, you know, it’s more accurate to say 50%, because there are 50% that don’t pay taxes already. But even some of the 50% that don’t pay taxes are gonna see some benefits. So it’s not inaccurate to say that 80% are going to see lower taxes and more disposable income. Now, what happens when that happens? What happens when people see that the economy doesn’t stop, when people see that the economy keeps growing, when people see that businesses keep hiring, when people see that they have more disposable income, what will their reaction be based upon what they were prepared for from the Democrats and the media? And that is where the Democrats are gonna get kicked. So looking ahead to 2018, every single Democrat in Congress, all 238 of them voted “no” on this. And what precisely did they vote “no” on? They voted “no” on cutting taxes. They voted “no” on allowing the American people to keep more of what they earn. They voted “no” on reforming the tax code in ways it hasn’t been in 30 years. They voted “no” on a piece of legislation that cuts taxes for 80% of Americans. 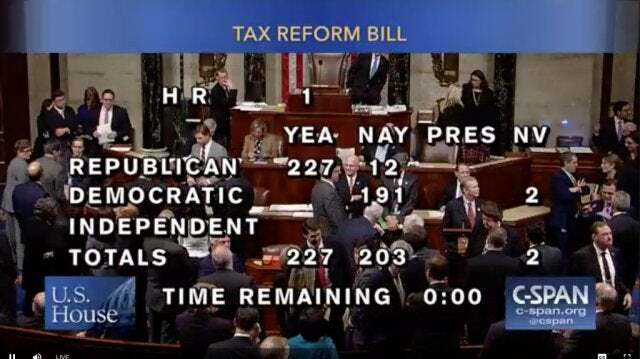 They voted no, all 238 of them voted “no” on a bill that will make U.S. corporate behavior much more competitive globally because of the reduction in the corporate income tax rate from 35 to 21%. They voted “no” on making American corporations more competitive in the world. They voted “no” on a piece of legislation that will contribute and will see gross domestic product grow at 4% per year. Chuck Schumer says the tax bill will be an anchor around Republican ankles. You know, Chuck Schumer, I don’t know how much money he’s got. But he’s got a lot more than you would think somebody earning $175,000 a year. He’s got lot of money. He has a law degree, but he’s never practiced law. He has only made bad laws. Is this bill so horrible, is this bill so bad the Democrats throw everything they have at it to mischaracterize it? Why are they doing this? Because the exact opposite of what they are predicting is going to happen. All the doom and gloom they’re predicting is not gonna happen. All of the growth and all of the personal income gains, all of the economic growth and employment is going to continue, and it’s going to speed up. What so frightens them about this? And here’s the thing. If this bill is so bad, if this tax cut is such a disaster for the Republicans, why did they do everything they could to stop it? If this tax cut is going to ruin the Republican Party, why didn’t they just shut up, stand aside, not provide any opposition and let it happen? DUFFY: If you listen to a lot of media sources they’ll go, “Oh, my God, this is tax breaks for the rich and does nothing for middle income Americans.” If that was true we would have real problems and those poll numbers would be right. That’s not the truth. If you actually look back to Ronald Reagan in the eighties when he passed tax reform, it had lower approval ratings than this package. But the truth is when people start to see more money in their paychecks because of tax reform and they see the economy grow they’re gonna love it. In the long run because more money goes to families and you’re gonna see better economic growth, this is gonna be a winner for America, but also those of us who voted for tax reform. RUSH: That’s a good start on explaining and answering my questions. But it goes much deeper than that. The Democrats are panicked. The Democrats did everything they could to stop this. The Democrats used the forces arrayed with them in the media to lie about this bill, to castigate it. You know, folks, would you oppose a raise? If your boss offered you a raise, would you suspect it? Would you reject it? Would you say that it is a trick? Would you say that it isn’t real? Would you say that your raise is gonna cost you money? Would you say that your raise is going to ruin or worsen your lifestyle? Of course not. But the Democrats have been trying to make that exact point, that this tax cut’s not gonna help anybody but a few rich guys, and it’s gonna hurt everybody else. The reason for their panic is they know the results of this. And they know the results because we’ve been there and done this. 1980 and the Reagan tax cuts, they know exactly what happened. And, my friends, I just want to make you remember something. Ever since the 1980s, when those Reagan tax cuts kicked in, the deficit came down, unemployment came down. There were a bunch of things that economic experts said were impossible. They said, “You can’t cut taxes and reduce the deficit.” But it happened. And it wasn’t even tight. It wasn’t even close. “You can’t cut taxes and reduce interest rates.” But it happened. “You can’t cut taxes and whatever.” And everything they said didn’t happen. They know full well what happens after a legislation like this. The Democrat Party, since 1987, 1988, has been engaged in revisionist history. The Democrat Party since 1987, 1988, has been on a mission to disparage, to impugn, to criticize, and to destroy everybody’s memory of the Reagan tax cuts. Whenever a tax cut is proposed, the Democrat reaction is, “Here we go. More trickle-down from the Republicans.” And they launch into how trickle-down doesn’t work ’cause the rich are mean and the rich don’t share. Their panic is because they know exactly what’s gonna happen here. They know that their efforts at revising history and trying to remind people that what happened in the eighties didn’t happen, they’re faced with it again. They could not stop it this time. So instead they have tried to mischaracterize it and create distrust and doubt in the minds of the American people. And they have succeeded, if the polling data is correct. But the polling data is gonna be overridden by real life. The polling data and experiences are gonna be overridden by what people actually experience and live as a result of this, exactly as it happened in the 1980s. One of the things that has been very frustrating to me since the eighties, it was so obvious those tax cuts resulted in an economic boom that lasted 20 years. Personal incomes rose, it was magical what happened, with the deficit coming down, economic growth going through the roof, unemployment coming down, wages going up. It was the worst thing in the world that could have happened to the Democrats. It was the worst thing in the world, because it proved that conservative ideological principles and supply-side economics does indeed work. They’ve been on a mission since the Reagan tax cuts to wipe out everybody’s memories of how well it worked in the 1980s. And they’ve succeeded because it’s been a daily thing. 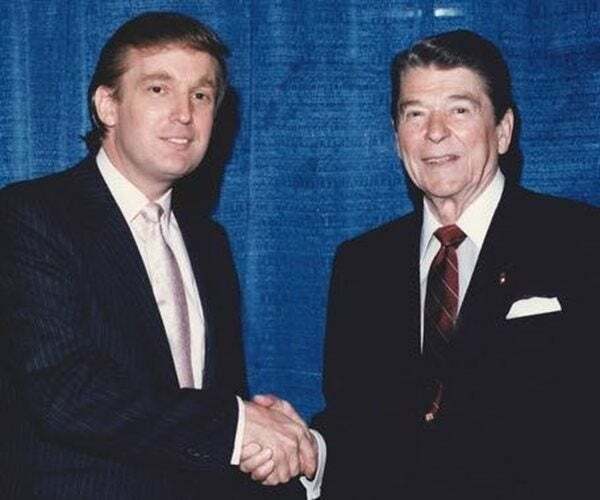 Among all the other things the Democrats and the media trash every day, they trash the Reagan economic policies of the eighties, supply-side economics and trickle-down, because they remember how effective it was. It disproves every economic belief they have. And they are quaking in their boots over what is going to happen here. And they are trying as best they can with the media to poison your mind and everybody else’s minds so that you don’t believe what is going to happen in the next year, the next two months, the next six years, so that you won’t believe what’s happening. They cannot afford for you to actually end up crediting Republicans and conservative policy for this. That’s why they’re panicked. This is the same Savannah Guthrie living in a fantasy world, believing she fooled people into thinking she didn’t know what was going on with Matt Lauer. The same Savannah Guthrie who was living in a fantasy world when Barack Obama promised all of us our health care premiums are gonna go down $2,500. She sopped all of this stuff up. The same Savannah Guthrie living in a fantasy world believing Obamacare would allow people to keep their policies and their doctors. The same Savannah Guthrie believing Algore’s predictions about dramatic changes in sea levels and temperature changes, climate change, unquestioningly. You talk about living in a fantasy world. And Ryan said (paraphrasing), “No, not at all. We have evidence our tax cuts are going to lead to economic activity and corporations are going to hire more people, and they are going to offer raises.” And he cited a survey from the National Association of Business manufacturers, which show the vast majority of businesses are gonna do just that. They’re gonna reinvest in their workers, reinvest in their factories, pay people more money, higher wages. It happened in the 1980s, it happens every time that it’s tried, which they know and which has them panicked. Now audio sound bite number 3. Last night in a conference call with investors, the executive vice president, chief financial officer of FedEx, name is Alan Graf. Talked about how the tax reform bill would impact FedEx. It’s only 14 seconds. Listen fast. GRAF: U.S. GDP could increase materially next year as a result of the U.S. tax reform. If this occurs, we would likely increase capital expenditures and hiring to accommodate the additional volumes triggered from this incremental GDP growth. RUSH: Let me translate this for you. This is a call, a conference call with investors, stockholders of FedEx, and he’s saying that tax reform, they expect it to trigger GDP growth, which will increase their capital, their investing in their own company. They will hire to accommodate the additional volume of business that GDP growth will trigger. This is just one company doing exactly what Savannah Guthrie thinks is a fantasy world. RUSH: FedEx has announced that because of the tax bill, they’re gonna be hiring a lot more people next year, because FedEx expects economic growth to expand next year, and that means that FedEx is expecting a lot more people to use their service. In other words, a lot more people are gonna be sending stuff via FedEx. So they’ll have to hire more people, might have to lease or buy some more delivery trucks, they might have to modernize their jet fleet. I mean, FedEx is an airline, after all. That’s how they get most of their stuff shipped. Many businesses are announcing pay raises because of this. And it was predictable. Folks, we’ve been there before. We’ve been there, done this. It’s just that the media and the Democrats since the 1980s have been doing their best to rewrite history. That they have been able to make people forget what happened or change their minds about what happened. I was gonna say it’s one of the frustrating things. People lived it. You would think, after living through such a robust period of economic advancement, that people would remember it. But you know what the problem is? They associated it with Reagan and not policies. And so the Democrats had no problem destroying the policy. Reagan was not around anymore, so they didn’t have to really bash Reagan, although they do and did. But Reagan remained overwhelmingly popular. So they continued to bash supply-side. And all during this period of time — you may remember this, Sam Donaldson was famous for this. He was a commentator on This Week with David Brinkley. And he kept talking about, because of the Reagan tax cuts, we’re gonna have a huge credit card bill to pay. We’re borrowing all this money. This isn’t real growth. And the American people are gonna have a come-to-Jesus meeting very soon down the road because none of this is real. But it was. Look, successful tax reform, the implementation of thoroughbred conservative ideology that works every time it’s tried is the biggest threat known to the left and the Democrat Party because it proves, not with theory and not with words, it proves with real life, it proves with action that it works. And its contrast with socialism is obvious. Socialism is a gigantic failure. Communism, ditto. So they have to destroy it. They have to revise history. They have to mischaracterize it. And they’ve been doing so since the eighties. And the way they have been dealing with this tax cut legislation is identical to what they have been saying about the Reagan tax cuts since they were passed and implemented. “Tax cut for the rich. Don’t care about the little guy. Big corporations don’t need any more money. Big corporations kill their customers, ruin their businesses, destroy the planet. Big corporations are not people. Big corporations and the rich do not share their money,” and they disparage trickle-down, when in fact trickle-down is exactly what economic commerce is. Trickle-down is exactly what economic growth is. And here comes the American left and the Democrat Party working in unison to destroy the entire concept. And to enough brain-dead low-information voters, the constant reputation, and we’re talking decades, works. And then there’s another factor. It’s so successful that future Republican presidents were afraid to re-implement it. The closest we got to Reagan-era or like Reagan-era tax cuts was George W. Bush in the first term in office 2001-2005, or 2004. We had serious tax cuts and they tried to destroy those the same way. So real life is gonna intervene here. Real life starting in February, people are gonna notice the distinct and dramatic changes that will result in them keeping more of what they earn. And I want to go back to 2018, 238 Democrats — the number floats. I mean, it’s a hundred in the Senate, and in the House and so forth, it may be more than 238. But the point is there is not a single Democrat that voted for this. There is, therefore, not a single Democrat who will be able to run for election or reelection next year by clinging to this. They will not be able to take any credit. They don’t have any fingerprints on it. It will be true and it will be easy for every Republican to prepare campaign ads against every Democrat seeking office that they voted against prosperity. They voted against you keeping more of your own money. They voted against you getting a raise. They voted against 4% economic growth and all of the good that entails. They voted against cheap energy. They voted against oil and gas exploration that would bring down the cost of energy for the consumer. They voted against everything that leads to economic prosperity, economic security, and economic freedom. And it’s on this basis that they somehow believe they are gonna sweep the House in 2018. There’s another story out there today that is part and parcel of this. And I don’t remember where it is, but it doesn’t matter, because they’re all the same. It’s Washington Post, CNN, New York Times, I don’t care where it is. The story is that this is such a big deal, it’s such a big accomplishment that there’s gonna be a hangover next year, and Trump and the Republicans aren’t gonna be able to get anything done. And they’re gonna live off of this for so long that they’re gonna think there isn’t much left to do. They’re gonna be on such a high that they won’t be able to replicate the high of this. This was a one-shot deal, yeah, and it was pretty cool, but they’re gonna be in a long 2018 hangover. Once again, wishful thinking. Let me tell you the reality. 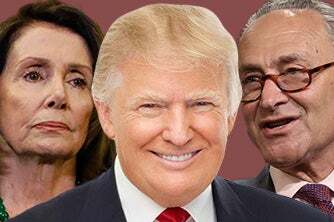 Do you realize that the Democrats did not force the issue on the DREAMers for this continuing resolution for the end of the year? You may not. Let me explain this very briefly. We’re up against the predictable and annual “scare everybody to death with a possible government shutdown” warning over the continuing resolution, coming up with a resolution to keep the government operating. That’s not why. I’ll tell you why. They think they’re gonna sweep 2018. It’s all about Doug Jones winning in Alabama. It’s all about Roy Moore losing. They think they can be patient now. Now they can wait and they can go for full-fledged comprehensive immigration reform amnesty for everybody in 2019, not just for the DREAMers now. Because they think they have the Senate won next year, and they think they’re gonna take the House, even though they are at the same time in a state of panic over the tax cut big passing. And I want to remind you again, they don’t have an agenda. They are not running on an agenda. They don’t have an alternative tax plan, for example. They didn’t respond to Trump and the Republicans’ tax cut proposal here with their own version. Because they don’t have one. They really do not believe in tax cuts. They promise them, but they never deliver them.